Over the Christmas break I really did just knit. By this I mean when I sat down and did something crafty I did not touch my crochet hook. There was not a design or commission in sight. Instead I felt the need to work my way through the ‘stash’. Work slowly and determinedly on a project that really had no future apart from joining my ever-growing blanket collection. 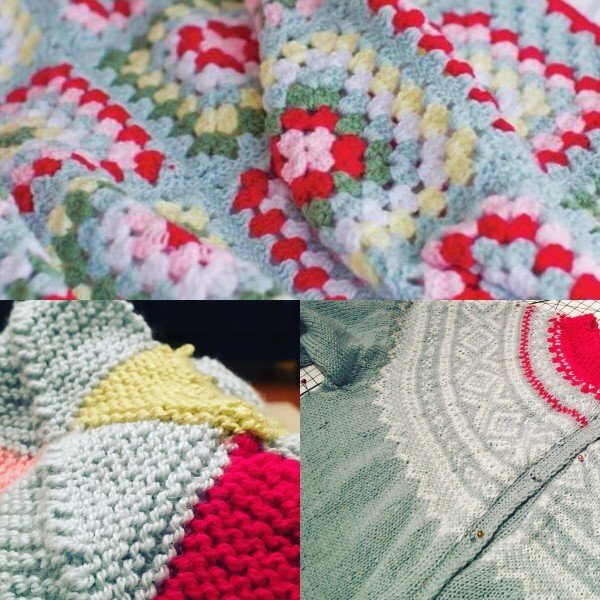 I also wanted to make a knitted companion to the Vintage crochet blanket which is in my new book – Granny Square Home. Why should the crocheters have all the shabby chic fun? A couple of years ago Memory Blankets or Mood Blankets were all the rage. 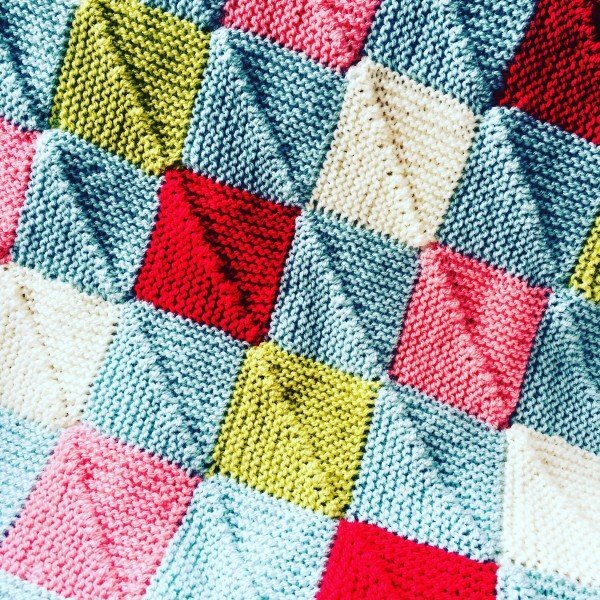 Many great bloggers used the year to knit or crochet a square a day which would either capture their mood or mark a memory. At the time, I admired these projects but had other commitments. However I do really like the look of a knitted mitered square so began working through my yarn stash to create a knitted blanket. If you are wondering how it works – you either cast on, or pick up a number of stitches along two sides of a square and then decrease the central stitches every other row to create a square. It is a simple and relaxing pattern. 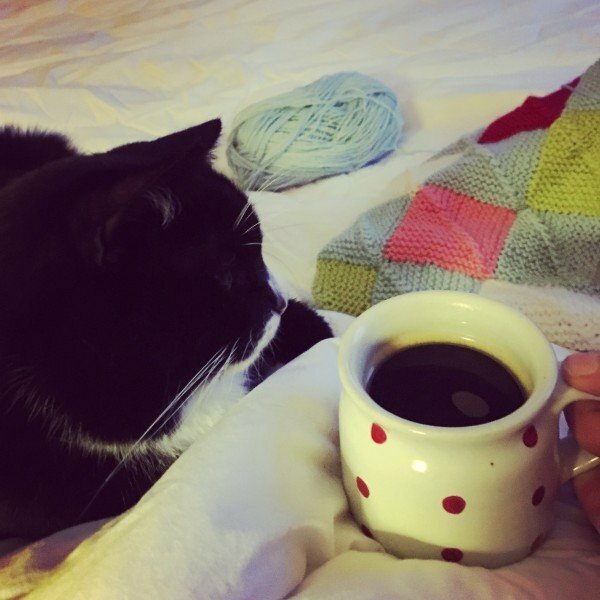 If you are keen to follow the pattern yourself I would suggest looking at this post on Ravelry. My squares are quite small but I am being rather ambitious in scale. I am aiming to make it approximately 50 x 60 inches which is the standard single bed side. My progress was going well until new commissions and designs came into the schedule. Now my lovely soft blanket is looking a bit sad in a basket upstairs. However I am going to be kind to myself and see it as a year long project. If you are interested to know what the yarn is – I am using the squiggy Stylecraft Special DK and have chosed, Duck Egg, Cream, Matador, Pistachio and Fondant. I am using 4mm needles and finding a short circular needle really helpful. 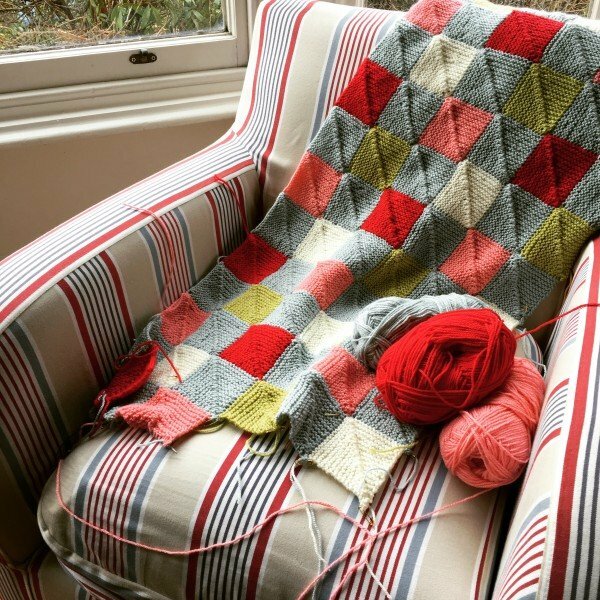 The telling thing is – as a crocheter – making a knitted blanket takes SO SO SO much longer…. If the colour combination wasn’t so pretty I might be tempted to give up. But no, my friends I will persist. This is after all a long game and I will love the end result. Thank you Sue and Barbara! Hello Cynthia,Ditto what Deb said..you shared your heart and your experience beautifully. I have been drawn to S. Africa for many years now. I crochet blankets, mitts, hats and sweaters, which go to Knit A Square. They in turn hand them out to the disadvantaged and orphaned children. Every photo of a child sleeping on the floor, who now has a blanket, makes me so grateful to be part of the KAS outreach. The children are so incredibly thankful for the smallest thing.a little stuffed toy, which gives them comfort and joy. The only toy they have ever had and probably every will have! I have wanted to go there for such a long time and pray that some day I will get there. Right now I am physically unable to do it, because of back issues (the flight would make me unable to do anything once I got there!). So I continue to support them as much as I can and crochet my little squares to make into blankets. But I pray for healing that will one day allow me to be more active in this kind of outreach. It means so much that you have shared this. Bless you for going and doing what you can..and for sharing your experience in such a visceral way! Hugs! That blanket looks beautiful! I only have dc wool, that would take me ages! 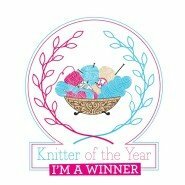 I knit and crochet. Self taught!